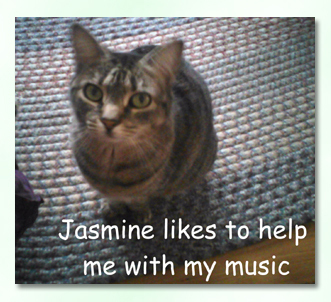 This page is Jasmine's, my little 10 year old tabby who we adopted two days before Christmas 2008, from foster care in Addison County, Vermont. Jasmine was abandoned by her mom in the barn where she was born. She was found trampled by the livestock, but rescued by the farmer's son and quickly delivered to veterinary care in Colchester, and went from there to foster/adoption. She is polydactyl in her front paws, meaning she has seven toes on each paw and tends to walk on tip-toe. Since we got her very young, she has been exposed daily to music in our household and quickly developed a sort of aural awareness of her own! 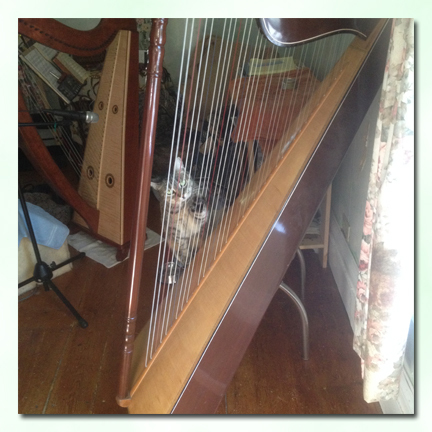 Jasmine quickly discovered my "learning" harp as a kitten and loved to crawl up inside the bottom soundhole. I used to worry that she would get stuck in there as she was growing and not be able to come back out, so as she got older I had to stuff a cloth in the base to keep her out. Later when the danger was past of finding her permanently wedged in the base of my harp, she developed the game of reaching inside and fishing out my harp humidifier. Jasmine plays her harp often in the mornings. Jasmine made the Paraguayan harp her own. After watching me play my wire harp for a while, she hopped on a nearby chair and started plunking on the nylon-strung Paraguayan. It's lightly strung, so she wasn't likely to break the strings. I do keep a cover over my wire harp to keep her away from it, since string breakage on that instrument might be more likely to lead to injury. She plays with both her paws and her teeth, and sometimes holds two strings with her canines while playing the string between them with her tongue, then abruptly releases them! If she's hungry and I'm downstairs, she knows enough to plunk the lowest strings. Loudly. Repeatedly. She invented the Thunky Box ®. 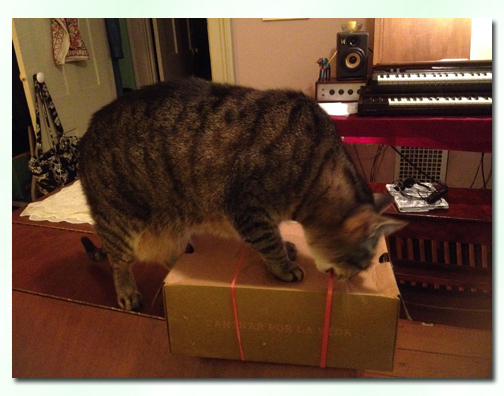 It's a shoebox with a large 8" rubberband around it. I have to periodically reorder giant rubberbands on eBay for her when they crisp out and break. She came up with this one when she discovered a package of George's important papers in a manila envelope with a big thick rubber band around it... sort of like a harp, but not quite! Plunk! Food time. And so close to the kitchen. We now have several of these scattered throughout the house. Her proudest one yet is the big metal popcorn tin with rubberband. We call that the Thunky Drum and there's also a smaller fruitcake tin next to it, also with a rubber band stretched across it. She darts back and forth from one to another, plunking and thunking away. It scares the other cats out of the kitchen, especially when she gets too vigorous and one drum or another crashes off the kitchen island onto the floor. a shoe box with two 8" inch rubber bands at different thicknesses (one's higher pitched than the other). 5-month old Jasmine with same-age best friend Jake. 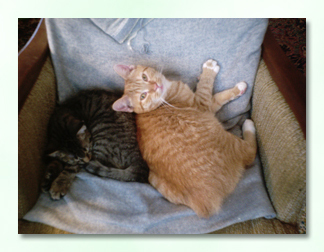 We adopted Jake two days before Thanksgiving and Jasmine two days before Chistmas 2008. Yes, he's missing his tail. He was injured at 3 months, dropped off by the side of the road, rescued and treated and then put into foster care. He and Jasmine are still very close many years later (2016). He is a serious mouse catcher!! 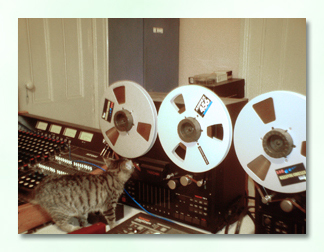 Jasmine as a kitten in my recording studio. She's about five months old in this photo and we had just adopted her. Jasmine celebrates her 10th birthday in style, with her very own harp! (Now she doesn't have to keep borrowing Sherri's!). durable, sounds nice, holds tune very well, and best of all, safe for Jazzie to play with! Click here to leave a message for Jasmine!